Trade show season is underway! 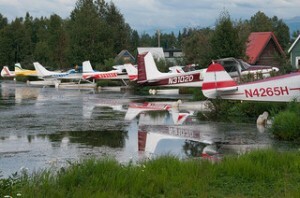 Hartzell Sales and Product Support representatives recently attended the Great Alaska Aviation Gathering in Anchorage. Hartzell’s crew was joined by representatives from our sister company, Hartzell Engine Technologies. Alaska has more pilots and aircraft per capita than anywhere else in the world, so it makes sense that an aviation trade show in Anchorage will draw a big crowd. Attendance this year was great, bolstered by still-frozen lakes and a constant wet snow the first day of the show. Thanks to the snow, the “inside” displays were that much more popular. Top Prop Performance Conversions were a popular topic for many pilots who stopped by the Hartzell booth. The Great Alaskan Aviation Gathering also gives us a chance to check in with our OEM and modifier customers who offer aircraft and conversions for the bush plane market. Davis Aviation, PPONK, Viking, Wipaire, Blackhawk Modifications, Quest and Texas Turbines were some of the Hartzell customers who attended the show. The center of the inside display area featured a brand new Cessna Caravan EX sporting a three-blade Hartzell prop. We are always looking for a chance to visit with pilots and aircraft owners. Check out our trade show schedule to see where you can find us in 2013.